On Wednesday, the New England Patriots formally announced that offensive tackle Matt Light was voted by the fans to be inducted into the team’s Hall of Fame for 2018, beating out defensive end Richard Seymour and linebacker Mike Vrabel. Light, who spent his entire 11-year NFL career as a Patriot from 2001-2011, played a key role in protecting quarterback Tom Brady’s blind side for three Super Bowl championships in five appearances. Light joins former teammates Kevin Faulk, Troy Brown, and Tedy Bruschi as the only members of the team Hall of Fame with three Super Bowl rings. Light was named to the Patriots’ 50th Anniversary Team in 2009 and earned Pro Bowl honors following the 2006, 2007 and 2010 seasons. He earned first team All Pro in 2007, blocking for an offense that set a then-NFL record 589 total points and 75 touchdowns in a perfect regular season. Patriots owner and CEO Robert Kraft issued a statement following the news of Light’s selection. Light is the 27th person to be inducted in the Patriots Hall of Fame since its official formation in 1991. Matt Light said Robert Kraft called him this morning to inform him of his induction into the Hall of Fame. "It was a very special call," he said, relaying they reminisced about their first meeting in 2001 — at the Patriots' offices in Boston — following the draft. When Matt Light received the call from Robert Kraft this morning, he was in the woods of Burrillville, Rhode Island hunting. "Chasing the elusive wild turkey," he cracked. This entry was posted in Patriots News, Patriots Photos, Patriots Twitter and tagged Kevin Faulk, Matt Light, Mike Vrabel, Richard Seymour, Tedy Bruschi, Troy Brown on May 16, 2018 by Robert Alvarez. With a win over the Buffalo Bills on Sunday, the New England Patriots earned a first round bye for the eighth consecutive season. However despite Week 17 still being a must win game to decide the first or second seed, the team put a pause on the regular season finale next week to celebrate the Christmas holiday with their friends and families on Monday. Bill Belichick on last-minute Christmas shopping and getting it done: "It was a struggle. 2-minute drill. We were out of timeouts." Below are some of the best postings from social media shared by the 2017 Patriots, their wives and former Patriots. Best gift I got this year was I got to spend Christmas with my wife @ashleykayhogan, Chase and Parker. Merry Christmas from the Hogans! Merry Christmas to everyone from the Clayborn's !! #PatriotsNation !! This entry was posted in Patriots Photos, Patriots Twitter, Patriots Video and tagged Antonio Garcia, Brandin Cooks, Chris Hogan, Dion Lewis, Dont'a Hightower, Drew Bledsoe, Duron Harmon, James Harrison, Julian Edelman, Kevin Faulk, Kyle Van Noy, Martellus Bennett, Matt Chatham, Randy Moss, Raymond Clayborn, Rob Gronkowski, Rob Ninkovich, Shaq Mason, Tom Brady on December 26, 2017 by Robert Alvarez. 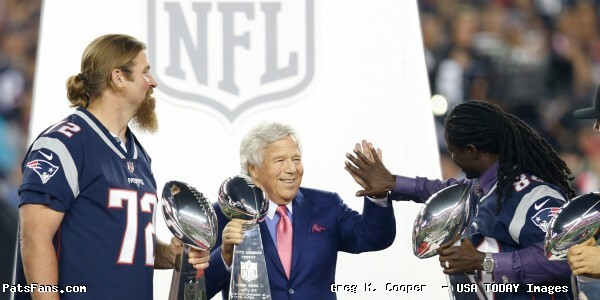 While Thursday nights outcome wasn’t what Patriots fans had hoped for, the opening night pregame ceremony was still a sight to behold as it finally closed the book on the teams 2016 championship season. Some of the best sights and sounds from the pregame atmosphere can be seen below, beginning with NFL Commissioner Roger Goodell’s brief appearance on the field, and the crowd response. Now some loud "ROG-ER! ROG-ER!" Chants from the crowd. “Operation Clown Face” dubbed Barstool Sports founder David Portnoy appeared to be a complete success as the clown towels could be seen all around the lower bowl near Goodell. Pats fans were booing so loudly that Dan Patrick thought it was the Chiefs. As Goodell walked off, Brady took the field, neither interacted. As for the moment everyone was waiting for, the banner ceremony kicked off with a performance from “Flo Rida” and actor Mark Wahlberg on the microphone introducing Patriots alumni and a current Patriot from five massive on field Lombardi trophies, accompanied by banners. Kevin Faulk, Matt Light, Deion Branch, and Julian Edelman all taking the field with the hardware beside team owner Robert Kraft. The ceremony also contained references to the Super Bowl score pre-comeback all throughout Gillette Stadium. With the banner officially raised, the New England Patriots can finally fulfill head coach Bill Belichick’s long standing wishes, who continues to be sick of people living in the past during his post game press conference following the disappointing 42-17 loss that put a damper on the festivities. This entry was posted in Patriots Commentary, Patriots Photos, Patriots Video and tagged Deion Branch, Julian Edelman, Kevin Faulk, Matt Light on September 11, 2017 by Robert Alvarez. At the beginning of every New England Patriots season, it has become an annual summer tradition under owner Robert Kraft where a former player is selected by fans for a spot in the teams Hall of Fame. In 2016, running back Kevin Faulk received the nod as the Hall’s 25th member and the ceremony that followed on Monday didn’t disappoint. Faulk spoke very openly about his time in New England, thanking both his teammates and fans for all their support over his 13 seasons and five Super Bowl appearances. Many of Faulk’s former teammates and fellow hall of famers were also in attendance, but quarterback Tom Brady brought the house down with the biggest surprise of the evening. Brady, originally unscheduled to speak, took to the stage revealing a “33” Faulk jersey under his jacket as a tribute of his own in response to Faulk’s now infamous moment of Brady support at the 2016 NFL Draft back in April. Chants of “Brady! Brady! Brady!” rang down from the thousands of fans in attendance, with Brady jokingly saying “No, this is for Kevin!” to respectfully remind the crowd whose night it really was and delivered a two minute speech to Faulk of his own. “Respect. Its something that we are losing sight of in America, in the world right now, that’s what that was to me. Respecting me as an individual, respecting the thing that I did and showing it right back” Faulk later said about Brady’s tribute. This entry was posted in Patriots Commentary and tagged Kevin Faulk, Tom Brady, Willie McGinest on August 2, 2016 by Robert Alvarez. The Patriots concluded Day 5 of training camp inside Gillette Stadium in front of a raucous crowd on Monday night. The team dressed in shorts and shells after being in full pads Saturday and Sunday. 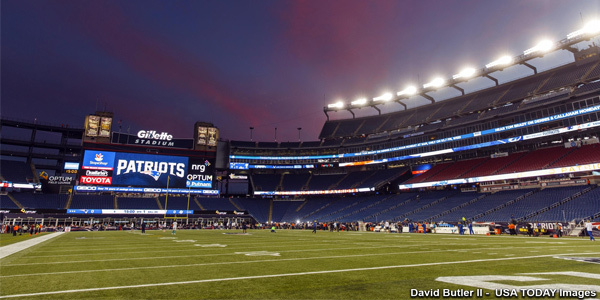 After having a crowd of over 21,000 people on Saturday, more than 24,000 fans filled the lower bowls at Gillette for the session. 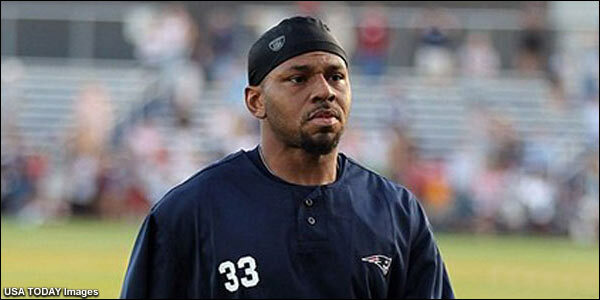 The big news of the day was Kevin Faulk being inducted into the Patriots Hall of Fame. Bill Belichick in his remarks and later in his press conference called him one of the most unselfish players he’s ever coached. He said that Faulk and Troy Brown were two of the toughest, most clutch, and best decision makers on the team. Faulk once again climbed the stage wearing a Tom Brady jersey under his suit coat. Something he did at the NFL draft this May. But he was in for a surprise. Brady came out in uniform for practice and unzipped his warmup jacket to reveal a Faulk jersey. Faulk later said he was speechless by the gesture. Brady called Faulk, one of the best players, one of the best teammates and one the best friends he’s had. When fans began to chant Brady-Brady-Brady… the QB stopped them and said that night was about Faulk. There’s something to be said for the respect that Brady has for his former teammate as this is the first time he’s spoken this summer. Faulk later addressed the media at the end of Belichick’s press conference and stated he wanted to savor the moment. “That’s the good feeling,” he said when asked about donning the red HOF jacket. 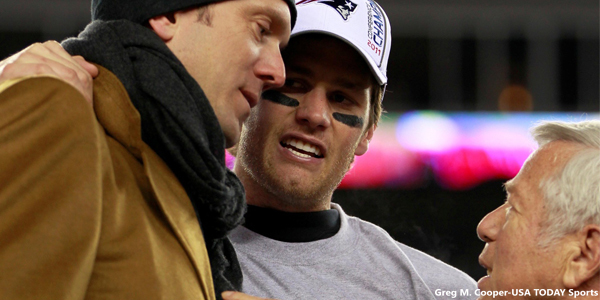 He was deeply touched by Brady’s gesture. “So much love, so much emotion…great moment,” he said. Faulk had some words for the legions of Patriots haters who accuse the team of being cheaters. “Let them come in here and watch the work we put in,” he said. Not Practicing: Danny Amendola, Julian Edelman, Alan Branch (NFI), Dion Lewis, Tre’ Jackson, Sebastian Vollmer, Nate Ebner (Olympic Games), Keshawn Martin, Chris Hogan were not spotted at practice. Offense Looks Mostly Sharp: When the team isn’t in full pads, it is the offense that usually rules the roost and Monday night was no exception. Tom Brady took the first reps with top offensive unit all night. While the competition was spirited, the practice didn’t have the intensity that the weekend workouts did. When Brady was off the field, he was idly chatting with Tedy Bruschi in the end zone, something that we haven’t seen much of this summer. Brady however, was mostly sharp on the night. The only poor throw he made was to Martellus Bennett who was running a deep cross from right to left and was wide open. Brady’s pass was behind him and when Bennett tried to stop to make the catch, he lost his footing. Brady made a beauty of a deep throw to Chris Harper who beat Jonathan Jones. And on another, he showed outstanding touch to Rob Gronkowski on a deep slant over Jamie Collins who had tight coverage. Jimmy Garoppolo wasn’t as sharp as Brady but had an ok session. 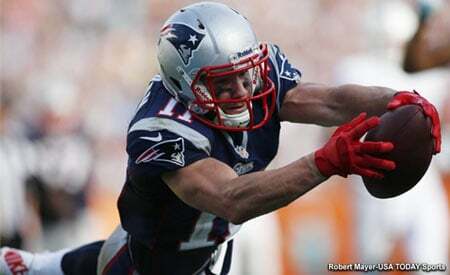 He was picked off by Devin McCourty after his pass went right off the receiver’s hands. He had another nearly picked by Justin Coleman. But he showed some sharpness too. He made a nice connection with Aaron Dobson over Cyrus Jones for about 20 yards. Jacoby Brissett didn’t have a great practice. As happens with rookies, he was holding the ball too long, made some poor throws, was picked off twice, nearly had a couple more and had too many throwaways. Kick Returner Seems to be Jones’ job to Lose: Rookie Cyrus Jones continues to get the first reps with the STs kick return unit. He’s showing good vision and decision-making and has that burst that can be dangerous if he gets past the first wave of coverage. Harper, V’Angelo Bentley and DeAndre Carter also are getting reps in the return game. Rookies Continue to Work with Top OL Unit: Rookies Joe Thuney and Ted Karras continue to get the 1st team reps in the interior of the offensive line. Thuney looks very comfortable out there and Karras bring a little bit of that nastiness that the team has lacked in the past few years. Shaq Mason was activated off of PUP but has had a difficult time seeing the field. He spent the majority of Monday evening watching from the end zone. Nate Solder and Marcus Cannon operated at the tackle position with David Andrews at center for the first team unit. Play(s) of the Day: Brady not only hit Gronkowski once in the corner of the end zone but did it twice. The big man is having a terrific summer and is darn near un-coverable. So while he’s been on fire he’s also been playing to the crowd. Immediately after his second touchdown, he ran over to the fans in the end zone and was firing them up even more so than they wore before. Which leads us to the next point. Watching the body language of the defensive players after Gronk’s second touchdown and resultant celebration, they were pissed. And rightfully so. Once in a while the celebration a big score is acceptable, but there is beginning to happen an alarming trend of daily scenarios where they cavort and are showing up the defensive players. Two words here…. Brandon Browner. Remember two years ago when the WRs were taking too much advantage of their defensive opponents in shorts and shells and they got a bit cocky. Browner set the tone immediately at the start of the next practice. He slammed Kenbrell Thompkins at the line then well after the whistle flung him to the ground like a sack of mail. We may have another Browner moment soon. If the team is in full pads on Weds or Thursday, look for Hightower or Collins to send a message that the defense is ready for all comers. The team is off on Tuesday and get back to work on Wednesday, Thursday, and Friday with practices scheduled for 9:15 a.m. 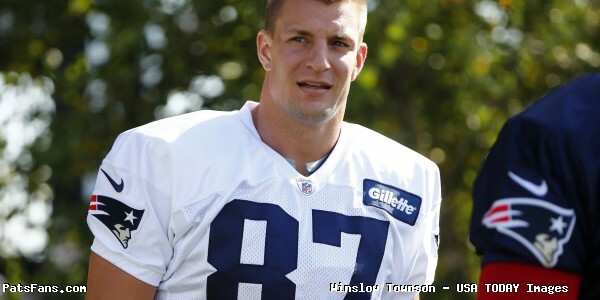 This entry was posted in Patriots Commentary, Patriots News and tagged 2016 Patriots Roster, 53 Man Roster Projection, Bill Belichick, Danny Amendola, Julian Edelman, Kevin Faulk, LaGarrette Blount, Malcolm Butler, New England Patriots, NFL, Patriots, Patriots edge rushers, Patriots Hall of Fame, Rob Gronkowski, Tom Brady on August 1, 2016 by Steve Balestrieri. On Sunday, Many New England Patriots players both current and former took time out of their day to create Father’s Day tribute posts on their social media accounts. Some of the best can be seen below. HAPPY FATHER'S DAY to all dads on Twitter, enjoy ya'll our day an have a Blessed but safe day!!! But perhaps the most touching message of the day came from head coach Bill Belichick, who mailed back a signed photo and personal letter to a fan who requested it as a gift for her father. This entry was posted in Patriots Photos and tagged Bill Belichick, Brandon Bolden, Drew Bledsoe, Julian Edelman, Kevin Faulk, Malcolm Butler, Tom Brady on June 20, 2016 by Robert Alvarez. The New England Patriots announced on Wednesday that former running back Kevin Faulk was selected by the fans to be the newest member of the Patriots Hall Of Fame for 2016. Faulk beat out former teammate, linebacker Mike Vrabel, and cornerback Raymond Clayborn, a Patriot from 1977-1989. Patriots Chairman and CEO Robert Kraft released the following statement. A career Patriot for 13 NFL seasons since being 46th overall in the 1999 NFL Draft ,Faulk is “the Patriots’ all-time leader in all-purpose yards (12,349) and kickoff return yards (4,098). He is also the Patriots’ all-time leading return specialist, totaling 5,041 combined return yards (4,098 kick return yards and 943 punt return yards). He ranks fifth in Patriots history in rushing yards (3,607), fifth in receptions (431), 12th in receiving yards (3,701) and eighth in punt return yards (943)” per the Patriots offical announcement. Faulk was an invauable, durable, and clutch piece to the Patriots offense during the early years of the Tom Brady era. An early highlight dug up by CBS Boston’s Michael Hurley shows Faulk passing to Brady in a regular season game in 2001. Former teammate Damien Woody, who blocked for Faulk in five seasons, also congratulated him on social Twitter following the news. Back at the end of April, Faulk made national headlines for wearing a Tom Brady jersey and including Brady’s name in the announcement of a draft pick in Chicago. The stunt certainly favored Faulk in the final vote. Induction ceremony for Kevin Faulk scheduled for Aug. 1. Free/open to public. Faulk also will be honored at halftime of 9/18 home opener. This entry was posted in Patriots Commentary, Patriots News and tagged Damien Woody, Drew Bledsoe, John Hannah, Kevin Faulk, Troy Brown, Ty Law, Willie McGinest on May 18, 2016 by Robert Alvarez. Both former and current New England Patriot players took to their social media accounts on Sunday to celebrate Mother’s Day. Check out some of the best messages and photos below. Happy Mothers Day! We love you! Always by my side. You're the best. I love you, mom! Happy Mother's Day to all you amazing Mothers. Happy Mother's Day mama love you! Happy Mother's Day to my A1 Day1! You've always had my back whether I was right or wrong! You're the most supportive and understanding person I know and I don't think God makes em any better than my mother! I express my love for you throughout the year so this day isn't any different! I love you mama!!! Thank you for everything mom, I love you!! Happy Mothers Day!! Happy Mothers Day to my angel and walking miracle! The blessings in my life are many. None greater than the blessing of these two beautiful people. Mom was the first person I ever knew. How lucky that she is also the best person I've ever known. Powerball odds!! Maura has been her equal as a mom which is the highest praise I know how to give. I love you both. Happy Mother's Day for all the hardworking women that have sacrificed so much for so many. This entry was posted in Patriots Photos and tagged Aaron Dobson, Brandon Bolden, Chris Hogan, Devin McCourty, Dont'a Hightower, Drew Bledsoe, Duron Harmon, Jamie Collins, Jerod Mayo, Julian Edelman, Justin Coleman, Kevin Faulk, LeGarrette Blount, Malcolm Butler, Martellus Bennett, Rob Gronkowski, Rob Ninkovich, Rodney Harrison, Tom Brady on May 8, 2016 by Robert Alvarez.